How to Change Your Computer's Name in Windows? 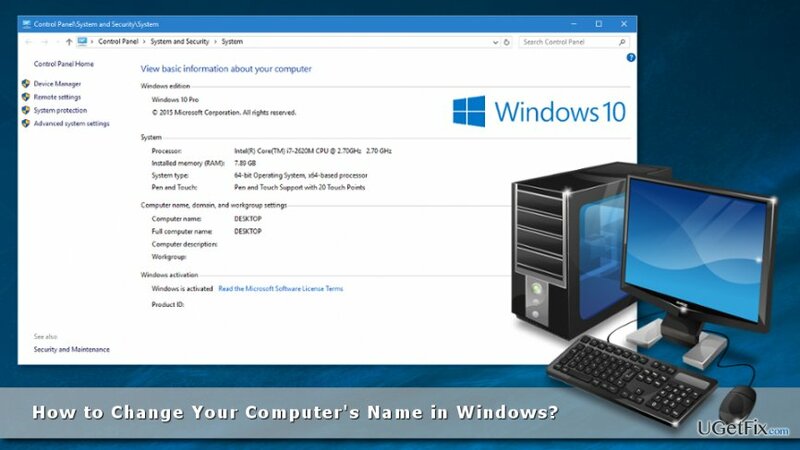 Home »	Optimize » How to Change Your Computer's Name in Windows? Issue: How to Change Your Computer's Name in Windows? I bought a new computer with Windows 10. I know that there’s a way to change its name, but I couldn’t find it. Could you explain to me how it’s done? Many users want to change their computer’s name for personal reasons. Most of the time they want to make it more personalized and easily recognizable in the network. Usually, when you buy a new computer, it is named with random letters, numbers or includes the brand of the PC. Thus, it’s not unique and might be hard to remember. One of the main advantages of changing the name of your PC is that you will be able to pair it with other devices, for instance, Bluetooth mouse or printer. Therefore, in the appeared list of gadgets, you will be able to find your computer easily by its unique name. It might seem hard to find necessary settings in order to change your computer’s name in Windows 10 and older OS versions. Indeed, there are plenty of settings, and it might be easy to get lost. Fortunately, we are here to help you to name your new computer with your preferred name. 1. Go to Settings and open System option. 2. Choose About section in the left panel. 3. In the About menu, you will see the current name of your computer. Below you should see “Rename PC” button. Click on it. 4. Enter your preferred name in the new box and click Next. NOTE. You can use all possible characters, but you won’t be able to use space. Click Restart Later if you want to see these modifications the next time you boot your PC. 1. Click on the Start button and navigate to Control Panel. 2. Go to the System section. Both of these buttons will trigger System Properties window. 4. Click on the Computer Name tab. Here you will see saying “To rename this computer, click Change,” thus click “Change…” option. 5. In the appeared Computer Name/Domain Changes window you will see a box named “Computer name.” Enter the name there. 6. Once you type your preferred name, click OK.
Click Restart Later to delay this process. Keep in mind that your computer’s name will be changed only after restarting the device.